Happy Thursday! Hope you're all doing great! We finally got some much needed rain last night, but now the sunshine is back and we're again at almost 100 degrees. As you can read in my title, I created another scene on my card, it's just what I love doing right now! I made this card for the new Digital Pencil (Bella and Bronte's )challenge, which is "In the Dog house", either choose a Mo Manning image with a dog...or choose one that depicts someone in trouble. I didn't see an image in my Mo Manning collection , that I wanted to use today, so I browsed through her images, and decided to buy this cutie called "Still Summer". I had been wanting to get it before, but somehow never got around it. The link above will lead you to her old store (still active right now), which is where I purchased this stamp, not sure if it is listed in her new store yet.It's one of her older images. I thought a brayered background would look nice with the image being the main focal point, so I created my beach scene using a brayer, some inks and stamps. Of course I haven't done much brayerin., so it's nowhere near perfect. Thanks to the wonderful tutorials from Michelle Zindorf, I am able to give this technique a try now and then. I colored the image using my faber castell polychromos pencils. The dog was cut out separately and adhered with a pop up dot for some dimension. 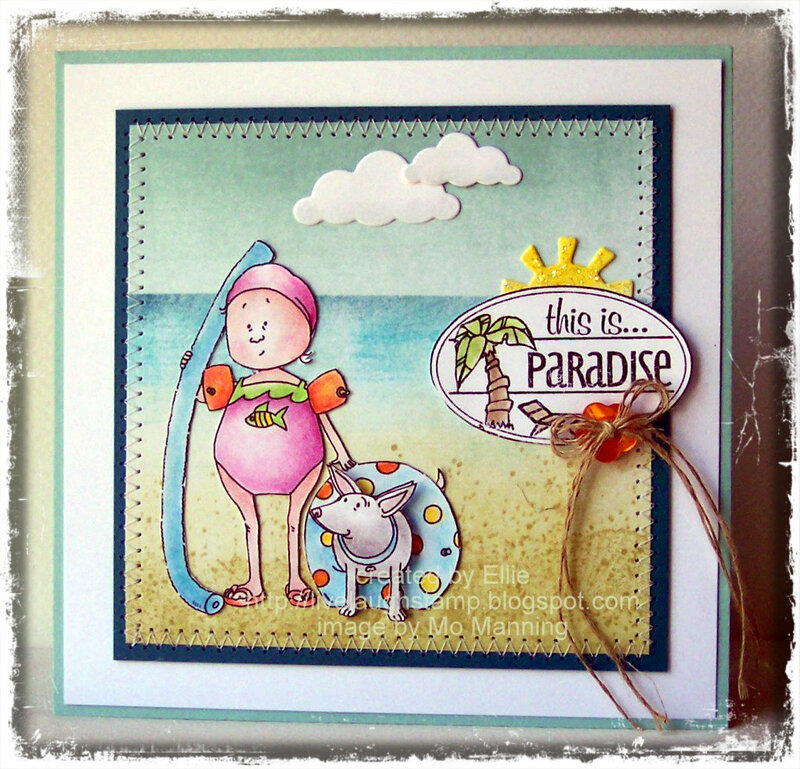 The sentiment I used is from the set "Summer Oval Letterseals" by Whimsy Stamps. The clouds in the sky are from Memory Box. I simply embellished with a little button and some twine. The added some glitter to the sun, which is part of Whimsy Stamps "Fun in the Sun "Shapeology die (matching the Summer Letterseals stamps). With this card I am also trying out for the Guest Designer spot at Mo's Digital Pencil. Would love to be part of the fun for 3 months!! Mo's images are just so much fun to color!! Besides Mo's digital challenge I am also playing along in the C.R.A.F.T. challenge with the theme of Stitching, at Crafty Ribbons they would like to see "the sea", Dog days of Summer at Delightful Challenges, Crafting for all Seasons wants to see water, and finally Crafty Creations wants to see Buttons. Thank you all so much for visiting today. I hope you liked my creation! This is a gorgeous card, I love the seaside scene you have created. such a beautiful beach scene ellie! an adorable image, beautifully coloured as always with incredibly straight stitching lines! good luck with the GD tryout. I just love your cards - especially the ones with Mo Manning images! Absolutely gorgeous design. To cute! You did a great job with the beach scene! It looks so real! This is just so so cute, have this image and have yet to color it up. Thanks so much for the inspiration... and thanks for joining us at Mo's this week. This is just such a fresh look! I love the background you've created, and your stitching is perfect! Glad you joined us in Mo's Challenge. What a sweet summer scene you've created. Love how you've added the sun behind the label with the sentiment - appears as the sun is far away on the horizon. The image is a cute one, and I love how you put all the elements together on this card. The stiching is fab too! 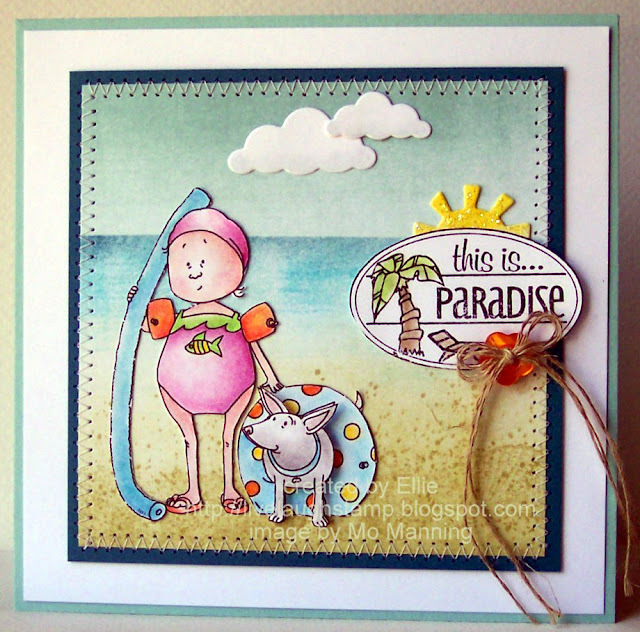 Love this image - so cute - and your card is a great showcase for it! Love the colors and layout! Wishing you a happy day today! I love this! Such a great scene youve created! Thanks so much for playing with us at Mo's! Well I think You're brayerin' looks mighty fine! :-) Your little scene is super cute Ellie and I'm so glad you joined us for the challenge this week at Mo's! What a fab card thanks for joining us at CRAFT this week hope to see you back soon.